A 19-year-old man has been jailed for life for planning a bomb attack that may have targeted an Elton John concert or Oxford Street in central London. Haroon Syed, of west London, admitted preparing acts of terrorism after trying to source weapons including a suicide bomb and machine gun. He was caught after approaching MI5 officers, who were posing as a fellow extremist, via social media. Syed was sentenced to a minimum of 16 years and six months. 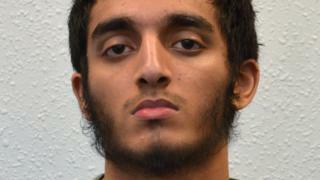 Last year, his brother was jailed for life for plotting to behead someone on Remembrance Sunday. Judge Michael Topolski QC said Syed wanted to carry out "an act of mass murder" and therefore a discretionary life sentence was warranted. Prosecutors say Syed's plans ranged from becoming a suicide bomber to staging a gun attack, and while he initially boasted of working with others, those people did not materialise. Instead, over the summer of last year, he made increasingly urgent efforts to secure weaponry. After he went online looking for help, a purported jihadist fighting overseas, known only as Abu Isa, introduced him to another extremist going by the name Abu Yusuf. This second man was, in fact, a group of MI5 officers who were playing the role of a jihadist in what became weeks of social media chat with Syed. Duncan Penny QC, prosecuting, told the Old Bailey there was initially some "suspicion on both sides" before Abu Yusuf concluded that Syed was a "committed brother" he could deal with. Syed then began talking about his aspirations and gave his contact a shopping list, saying he wanted "do martyrdom" after first causing "damage" with a machine gun. "Can you get the gear?" asked Syed. "You will be involved right? "Two things. Number one, machine gun and we need someone who can make a vest you know the dugma [button] one. So after some damage with machine gun then do itishadi [martyrdom] ... that's what I'm planning to do." The undercover officer told Syed guns were expensive - but he might be able to get someone to build a bomb. Syed floated the idea of going to fight overseas with his new-found friend - but revealed his passport had been cancelled by the authorities. He tried and failed twice to get fraudulent loans of thousands of pounds to cover the cost of firearms - and eventually agreed to meet his contact in a coffee shop in Slough, Berkshire, to finalise an alternative plan. Over two meetings, he talked about his aspirations and then handed over £150, asking for a bomb packed with nails. The conversation was secretly recorded. "I was thinking of Oxford Street," he told his contact. "If you put those things inside called nails, do you know what that is, nails? Those sharp things - lots of them inside. "Good man, can't wait akhi [brother]. If I go to prison, I go to prison. If I die, I die, you understand? I have got to get to Jannah [heaven]." The undercover officer later told Syed a "bomb-making brother" would have the device ready within days - and the suspect went online to narrow his list of targets. His web searches included "packed places in London" and "Elton John, Hyde Park, 11 September" - a major concert hosted by BBC Radio 2 which also featured Status Quo and Madness. Prosecutors say Syed's character had begun to change outwardly in late 2014, coinciding with the growing support among British extremists for the self-styled Islamic State group. During the course of the investigation, detectives found his web searches jumped about as he tried to satisfy himself that an attack on civilians was theologically justifiable. One of his last searches, a week before his arrest, was: "How can I stop being upset about the UK killing innocent Syrians and get on with my day?" When counter-terrorist detectives arrested him in September and asked him for the password for his phone, he replied: "ISIS - you like that?" Syed's was one of 18 terror plots to have been foiled since 2013. Mitigating, Mark Summers QC said it was a "crude, ill-thought-out" plan made at the behest of others. The court heard Syed had fallen under the influence of members of banned extremist group Al-Muhajiroun, and that he now publicly rejected his past beliefs and condemned the recent bomb attack in Manchester. But Judge Topolski told Syed: "You were not lured, you were not enticed, you were not entrapped. Deb Walsh, deputy head of the counter-terrorism division of the Crown Prosecution Service, said: "Haroon Syed is clearly a danger to the public who was prepared to carry out indiscriminate attacks against innocent people. "The compelling evidence presented by the CPS left him with no choice but to plead guilty."